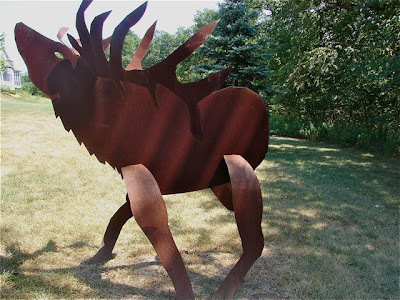 tallgrass prairie studio: What Do I Do With A Giant Moose? What Do I Do With A Giant Moose? Thanks so much for all of your well wishes. It was hard for me to write that last post. Saying it out loud makes it real for me. I never liked being the new kid at school, (which I was way too many times) and it feels a bit like that, so I truly appreciate you reaching out and your welcoming comments. As some of you know I live in a rural area outside of Kansas City. I have acres...space to spread out and when space is available, things tend to fill up that space. 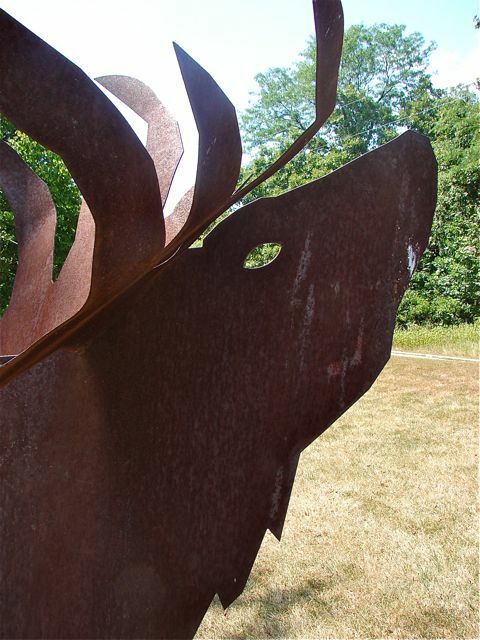 About 10 years ago my sons and husband decided that I needed a sculpture to accent part of our land, so for Mother's Day, I received a giant iron Moose. Who doesn't love a moose on the Kansas prairie? I adore my moose. Aren't his antlers simply fabulous! He watches over me and guards the entrance to our property. I've been cleaning out every room and deciding what gets tossed, what someone else might want, and narrowing down what will come with me to Chicago. If I haven't used it in a year, it's out of here! But then there's the moose. I'm wondering if there is an iron moose adoption program, or better yet a moose on loan program. 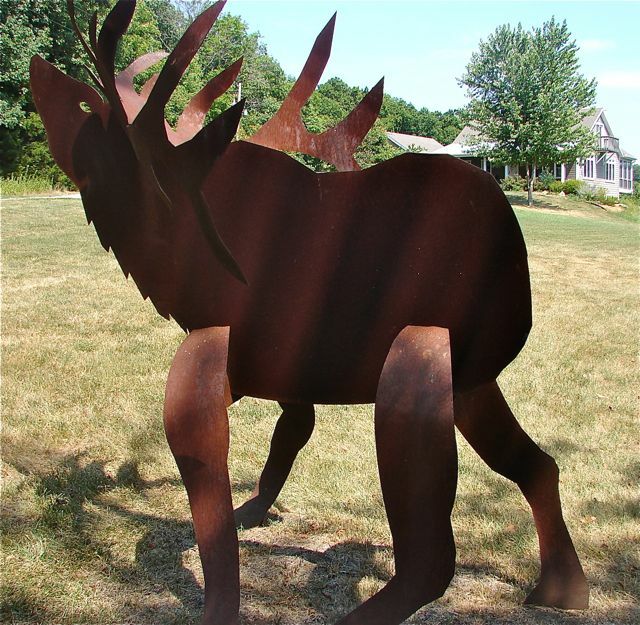 It takes a special person to adopt a giant iron moose. There would need to be an interview of course, and a site survey. My moose won't live just anywhere. It's a lot easier to find homes for excess quilts. Maybe Bloggess will take him, to accompany Beyonce the giant metal chicken. OHHHH, I wish I was closer, I would totally adopt (even on a loan basis!) your awesome moose!!! Given that I live in a third floor walk-up, not very practical for him to come live with me. Too bad, I bet we'd be fast friends... But I do have room for excess quilts and fabric. Just so you know. Darcy was admiring your moose when we came out to cut fabric. I'll have to let her know it's looking for a home! I love the moose! I wish I had the land...I would give it a loving home. Unfortunately, I think right now it would take up our ENTIRE front yard! There ya go.....not even a dozen comments and your moose has a new home. *S* Aren't bloggers great? If I were closer to Kansas he could come live with the pelican, giant sundial and the whippet we have here in Louisiana. He would fit right in. glen: I really wanted the leaping cement dolphins but frank put his foot down on those guys! LOL I agree with Laura! Have Jenny adopt your moose! This makes me think about if my father-in-law ever had to move to the city because he's got quite a collection of carved wooden bears. Not his fault.. my mother-in-law thought it would be funny to get one... which led to another, and another... yikes. Oh, Laura, I LOVE you for thinking the same thing I was thinking. The Blogess could totally freak Vincent out with that moose. We'd probably get 4 or 5 hysterical posts out of it as well! PS...I think the computer is messing with me. My word verification is whorse. Took me three times to spell correctly. I was thinking he might be a good partner for Beyonce too! I have a friend in the KC area who is in love with moose. She & her fiance are even working them into their upcoming wedding! I sent her the link to this post in case she was interested. How about Moose on the Porch quilts, he would be a cool addition. I agree with Laura. And I had never read anything by Bloggess, which turned out to be pretty funny. I hope you find a good home for him. He looks awesome! Here in Chicago at Christmas time people put those light up deer lawn ornaments on their tiny little city balconies, my 4 yo sees them and screams "city deer", so you could always bring the moose, hang lights on it and entertain your neighbors as passers by shout "city moose!" Good luck w/ your moose relocation program! If I wasn't 4 hours away, I'd probably consider the adoption. I have a good solid 1/2 acre and my Sister loves moose. And bonus, it could scare away the deer that attack my garden. Maybe you could use him for a coat rack. He is far to cute to get rid of. he is so wonderful - I do hope you find a spot for him. Jacquie, I live in Berryton (between Topeka and Lawrence) on acreage and would love to put that Moose out with my horses. This of course only till you have room for him again. Man, he'd look great at the house up north -- but getting him to Michigan would be a little difficult, I think. Good luck finding him a home! Um...I think he is actually an elk. The fuzzy neck, his less than rounded nose, his antler. Whatever his pedigree, his is spectacular! Head him my way - he'd love it on the beach! Oh I LOVE LOVE LOVE your moose... do you think he would be very happy in SW Florida??? All my best for your move! Not quite sure a giant moose would really fit in to a rural English setting, rolling hills, acres of farmland - maybe he would feel right at home amongst the grazing cows behind my house. Does he like long distance travel? Tee Hee, I live in a condo, so I don't have room for a moose, but quilts & fabric - send em over! Would you feel any better if you knew your moose was an elk? How about using him to display quilts or do a yarn bomb? oh man... if only i lived closer!! i would LOVE this moose in my yard (back yard of course since i don't know that the homeowners assoc would like the moose so much in the front). Are you sure you can't take him with?? Maybe a towel holder in the bathroom?! I'm kidding. He is pretty stinking cool though. This really had me giggling think about how our black lab would react if she suddenly found your moose in our back yard. Hope you find him a good home. I live in Lawrence, you are welcome to store it at my place. I would love to have him visit my house if I had a way of getting him here! Maybe you could donate to a zoo or animal shelter? He is awesome! That is definitely an ELK--not a moose--wrong profile, and the real give-a-way are the antlers--not moose antlers! as for the moose - perhaps it can look after your Dad!? Just how big is this moose? Depending on how much room he needs to roam, I might have a proper grazing area for him. OMG, what are you going to do with all your Christmas trees?!?! My sisters live in Blue Mound and have 100 acres. Perhaps they need a moose. Looks like there are so many folks who would like to adopt your moose for you. The Windy City is gaining and Kansas City is the loser. I wish you many wonderful blessings and memories that will be made that are happy and rich and fun to look back on. You are in for an adventure and new friends. Keep the old ones too. What about an art Museum, or a childrens museum? There are always places that would love to have more art around, but they can't afford it. At a library, or a business. You let them know that it is a loan and put it on paper. um, too...kate's right...your dude is an elk...but handsome nonetheless! oh no! he must not go! put him outside your door!! in the intrance way! don't you have a balcony or something? use him as a coatrack!! HE.,MUST.NOT.GO!!! Jacquie - does your moose have a name? Does he want to come live with us? I'll be his foster momma!